Why all the hype about quinoa?? Sometimes I hear about a unique combination of ingredients and am completely disgusted. Other times it intrigues me to the point that I have to make the recipe. I don't remember where I first heard about this classic Greek soup that combines egg and lemon, but it fell into the latter category. Bring stock and rice to a boil in a medium saucepan, and then reduce heat and simmer until rice is tender (about 40 min). In a small bowl, beat eggs with a hand mixer until they become foamy. Then stir in lemon juice. Add about half a cup of the stock and rice to the egg and lemon, while constantly stirring. Remove the saucepan from the burner (this is critical!) and stir in the egg and lemon mixture. Stir in salt, and garnish with pepper. Serves 3. I have to admit that the combination works. It's not something that I could ever consume in large quantities because the lemon gives it an intense flavor, but I enjoyed a small bowl of it with dinner. There wasn't much of an egg flavor, but they gave the soup a slight creaminess that was nice. My research in the lab has not been going well at all lately, but at least my kitchen experiments work!! Well, this is the last recipe from this month's cookbook of the month ("The Olive and the Caper"). It was fun to stray from the general-purpose books, but I didn't end up making as many things as I have in the past because I didn't want to burn myself out on Greek food. There are many more recipes that I want to try, particularly the black-eyed pea salad that Candice recommended in the comments on my post about Greek shrimp and tomatoes. Of the recipes that I tried out of the book, the shrimp and tomatoes was my favorite dish, and my parents seemed to enjoy the leftovers quite a bit (and are apparently planning to make this themselves). I could eat that stuff every week. I also really enjoyed the Plaki-style snapper and zucchini and this soup. I made a summer vegetable soup from this book as well, which was good but rather simple and bland (though it was perfect while I was sick). I didn't end up writing about it because it didn't remind me at all of Greece. Hey, you can't win them all. Overall, I've enjoyed this book, but I'm sad that I couldn't try any of the phyllo recipes, so if you know a way to make it work with gluten-free flours, please let me know!! Usually I decide on a cookbook for the next month long before the current month is over, but I have no idea what it will be for September. I suppose I had better get to work! I came home with 3 beautiful pattypan squash from my CSA share this week. I occasionally slice and saute pattypans if I'm running short on time, but most of the time I can't resist their shouts of "stuff me!". This was also the first week of corn in my share, and I couldn't wait to try it out. Put the squash in a large pot with about 1 inch of water. Cover pot, bring water to a boil, and let the squash steam until they begin to get tender (about 7 min). Remove squash from pot and let them cool. Once they've cooled, cut off stems and scoop out as much of the inside of each squash as possible. Roughly chop the scooped out squash and set it aside. Heat oil over medium heat in a large skillet. Saute onion until it's tender, and then add garlic and cook for an additional minute. Stir in chopped squash, beans, corn, tomatoes, and spices and cook for a few minutes. Place the squash shells into a large baking dish and stuff them with the bean mixture. 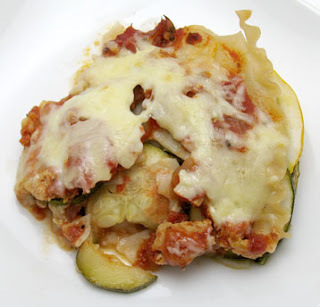 Top each squash with a pinch of cheese. You will likely have tons of the bean mixture left, so pour this into the dish around the squash shells or bake it in a separate dish. Bake at 350 for 20 min. Serves 5. First of all, this corn is delicious. I'm tempted to buy dozens of ears from my CSA farm at the farmers' market and freeze the kernels. The problem is that I have very little freezer space left, and I would love to store peaches and applesauce for the winter. We'll see what wins when it's all over. Anyway, enough about corn. The squash was very good, and I was happy that I listened to its pleas for stuffing! This would have been great with a jalapeno, but I was all out of fresh peppers. I'm submitting this dish to Weekend Herb Blogging, which is organized by Haalo from Cook (almost) Anything At Least Once, and is hosted by Rachel from The Crispy Cook this week. I don't think that my parents realized that they were going to be in the business of hauling food back and forth between Florida/Georgia and Michigan when they decided to drive up to visit me. They arrived with 3 dozen eggs from my mom's boss and hundreds of tomatoes, a giant watermelon, 6 butternut squash, and a ton of figs from my grandparents' garden. On the way back, they were loaded down with apples and peaches, Michigan wine, and all of the gluten-filled products that were still sitting around my kitchen. We were in somewhat of a hurry to eat the figs, because we knew that they needed to be consumed before we headed off to Toronto. While I can sit and eat dozens of figs, I thought it would be fun to do something a little bit more interesting. I didn't want to interfere with their amazing flavor, so I decided that a simple roast with honey would be a nice solution. 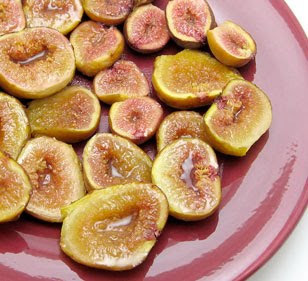 Place fig halves in a medium baking dish and drizzle with honey. Bake at 350 until figs are soft, but haven't completely fallen apart (about 40 min). Serves 3. 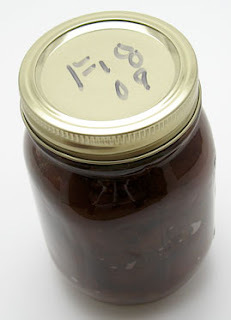 My parents also brought a jar of fig preserves that my grandpa made from this year's harvest. He makes wonderful preserves and, as a small way of saying thanks to all of my faithful readers, I would love to share them with someone. So, just leave me a comment telling me about your favorite way to eat figs by Wednesday, September 9th, and I'll draw a random number on Thursday to select a winner. Make sure to leave me your email address if I can't access it through your blog profile. Unfortunately I can only afford to ship to them within the United States. I wish I could share a jar with all of you!! While contemplating my year of blogging, I was reminded that my take on food was dramatically changed about a year ago when I read Barbara Kingsolver's "Animal, Vegetable, Miracle." Her stories about her family's year of eating almost exclusively things that they produced or that were available from the local community inspired me to focus more on the foods that are available to me from my community. I'm very lucky to live in a place with fabulous farmers' markets, several dairies, and sources of almost every type of meat that comes to mind. This year I've taken full advantage of this, and all of my animal products (with the exception of yogurt and a few types of cheese that aren't available) have come from local farms. Now that summer is in full swing, I would say that I get about 90% of my produce from the farmers' market. Perhaps I'm spending a little bit more money, but it's worth it to me to be able to interact with the farmers, know that the animals aren't being mistreated and the food isn't being sprayed with toxic chemicals, and have the opportunity to enjoy the amazing tastes that are only available when food is in season and hasn't been shipped around the world. Plus, I love being able to avoid the anxiety-inducing grocery stores as much as possible. In honor of my blogiversary, I decided to reread "Animal, Vegetable, Miracle" now that I've become more of a locavore (though still not nearly to the degree of Kingsolver's family). I can relate to many of her stories and she definitely has a way of making the labors of farming hysterical, but one part stuck out to me. She talks about how it's ok to stuff your face with each type of fruit or vegetable as it comes into season - each one will only be available for a short time, and you must enjoy it while you can. I definitely didn't understand this way of approaching food when I read the book last year, but now I know what she means. Now that so many things are available at the market, I'm eating up a storm. Melons, blueberries, peaches, apples, peppers, cucumbers, tomatoes, corn, eggplant, zucchini, potatoes, and a host of other options are at my fingertips. I can't imagine a better smorgasbord. So, it seemed only natural to include a "local" dish in the brunch that I made to commemorate my blogiversary and Dad's birthday. I use the quotes because my parents brought the eggs from Florida (Mom's boss has a flock of chickens) and the tomatoes from my grandparents' garden in Georgia, and I picked up the eggplant and zucchini from a farmer at the St. Lawrence Market in Toronto. But, in essence, I knew where all of the food came from, and there weren't any special trips to get the food to my kitchen. Heat oil over medium heat in a large oven-safe skillet. Saute eggplant, squash, and garlic until they are tender, adding more oil if necessary. Whisk eggs, turmeric, and salt and pepper together in a bowl, and pour them into the skillet. Rotate the skillet so that eggs spread out evenly, and then let it cook until eggs are mostly set (about 8 min). Then put the skillet in the oven and bake at 350 until eggs are cooked through (about 10 min). Garnish with tomato slices. Serves 6. 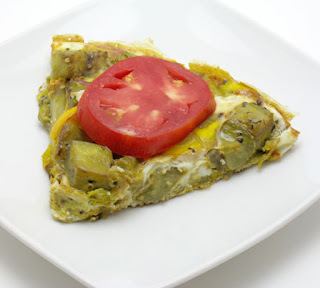 I really enjoyed this frittata. It came about via my favorite way of creating recipes: think of everything you have available, and throw it all together in a pan. I can't remember ever having eggs and eggplant together, but I love the combination! The delicious tomato was the perfect addition, as well. Another thing that I learned this year is that if you're using quality ingredients, simple is often better. Let them speak for themselves. It's time for another installment in the Whole Grains 101 series, and this time the focus is on quinoa. Quinoa has become popular lately and, although I'm not sure why the public decided to focus on it over other grains, I'm glad to see people excited about something other than wheat, corn, and rice. The most difficult thing about quinoa is learning to pronounce it (it's 'keen-wa'). I've been correcting my parents for over a year now, and they still call it 'kwin-oh-a'. I suppose that I should give up at this point and let them mispronounce it... at least they're eating it. Ok, so first off quinoa isn't actually a grain (it's actually the seed of a plant related to dark leafy greens), but it's usually used as one, so I'll include it anyway. Quinoa was originally grown by the Incas, but it has recently become popular in the U.S., particularly among vegetarians, because it's considered a complete protein. There are three main colors of quinoa: ivory, red, and black. Ivory is the easiest to find, but red and black usually also show up on the shelves of natural foods stores. Quinoa is a small "grain," similar in size to millet. My favorite thing about quinoa is its unique look after it's cooked - the seeds each have a pale ring around them that often falls off. What does quinoa taste like and how is it used? By itself, quinoa doesn't have a very distinct flavor, which makes it ideal for absorbing strong flavors that are cooked with it. It becomes fluffy when cooked, and it can be used in just about any recipe that calls for rice or millet. I've seen it in everything from breakfast porridge to salads to cookies. Quinoa flour can also be used to make gluten-free baked goods, but it has the tendency to be somewhat bitter, so it's often used in small quantities. Because of quinoa's popularity, it can be found at most grocery stores, usually with the rice. However, I typically buy it from the bulk bins at natural foods stores because it tends to be somewhat cheaper and I can get the amount that I want. 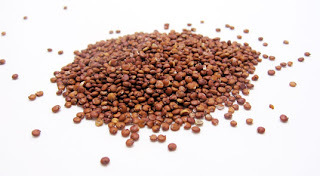 Occasionally I have seen red quinoa in bulk bins, but usually red and black varieties are only sold in prepackaged containers. Quinoa can also be ordered online at various websites, such as Bob's Red Mill. If you have room in the refrigerator or freezer, store your quinoa in there in an airtight container. If not, keep it at room temp but try to use it within six months (but again, make sure it's in an airtight container). If you cook a big batch of quinoa, it stores well in the refrigerator for a week or so and in the freezer for virtually forever. Although I rinse most of my grains, this step is critical when cooking quinoa because it has a bitter coating which must be washed off. This can be a pain in the neck because quinoa is so small (you'll need a very fine mesh strainer), but please don't skip this step. Quinoa cooks rather quickly, just like millet. First, bring 2 cups of water or stock to a boil in a saucepan, and then add 1 cup of quinoa and let the liquid return to a boil. Then reduce heat to low, cover, and let simmer until all of the liquid is absorbed (about 15 min). Let it sit in the covered pot for a few minutes, and then fluff with a fork and serve. This will yield about 4 cups of cooked quinoa. 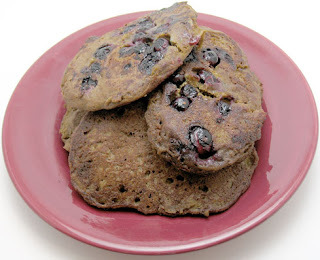 Teff blueberry pancakes recipe to celebrate my blogiversary! Well, it's been a year since I started this whole thing. Coincidentally, it's also my dad's birthday. I suppose it's not such a coincidence - I got the idea when I called to wish him a happy birthday and the conversation turned to cooking. He suggested that I keep some kind of journal to keep track of recipes that I try, and I immediately decided to start a blog. So, many thanks to Dad for starting this adventure! For several months I kept it private and there were only a few family members (and after a while a few friends) who knew about it. I never expected that anyone else would be interested in reading it, but I decided to open it up to the public just in case. Now I spend more time cooking and writing than I ever thought possible, and I'm ecstatic that people who aren't related to me actually find it vaguely interesting. In addition to Dad, I must thank my other loyal readers who have been with me from the beginning, and all of you who have found my blog through one way or another and think that it's worth reading! I can't tell you how excited I get with each and every comment. If you've seen Julie and Julia, you may remember Julie's reaction to the first comment she receives. I can definitely relate :). Speaking of Julia, I'm also glad to have received some great advice from Julia at Grow. Cook. Eat., my blogging mentor, over the last few months. It's all too fitting that my parents are visiting this week. So, for Dad's birthday, I decided to make brunch. I almost never cook big breakfasts, so this was my perfect opportunity to try out several new recipes. Unfortunately for my parents, this meant that they had to be guinea pigs for my first gluten-free pancake adventure, but they're good sports. I did let Dad pick the type of pancakes, so I suppose that we all won. Whisk dry ingredients (teff flour through salt) together in a large bowl. Combine wet ingredients (water through honey) in a separate bowl, and then whisk them into the dry ingredients. Heat 1 tsp oil in a skillet over medium heat. For each pancake, add 1/4 cup batter to skillet and spread it out with the back of a spoon. Drop some blueberries onto each pancake and wait until bubbles start to form on the top. Then flip and continue to cook for another minute or so, until pancake is cooked through. Makes 9 medium-sized pancakes. I suppose it's a good sign that the only way that Dad could stop eating these is to get up and leave the table. I loved them, too, and they didn't taste "weird" like some gluten-free baked goods do. I'm really becoming obsessed with teff - it works great for breakfast because of its hint of a chocolate taste, and it's extremely filling. This convinced me that I should put in the effort to make breakfast more often. It was definitely a great way to celebrate my blogiversary and Dad's birthday! My parents are visiting me this week, and we decided to venture to Toronto and Niagara Falls while they're here. Taking a trip always means franticly cleaning out the refrigerator first (I can't stand the thought of food going bad while I'm gone), and this time I had some zucchini and kale that really needed to be cooked. I also have a plethora of tomatoes right now because my parents brought me at least a hundred from my grandparents' garden in Georgia. I couldn't be happier - my grandparents have the tomato growing down to a science. Or maybe it's all in the soil. Either way, I love them enough to bite into several a day as if they're apples. I knew that whatever I did with my zucchini and kale, it was going to include these amazing tomatoes. Heat oil in large skillet over medium heat, and saute onion until tender. Then add garlic and cook for another minute. Add zucchini, tomatoes, basil, oregano, pepper, and salt, and let cook until zucchini is fairly tender and tomatoes are falling apart (about 10 min). 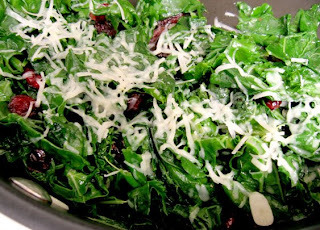 Stir in kale and continue to cook until kale is wilted and tender. Serves 4. At the end of a busy day, I was simply looking for a way to quickly cook my veggies, but after all was said and done, I would definitely make this again. 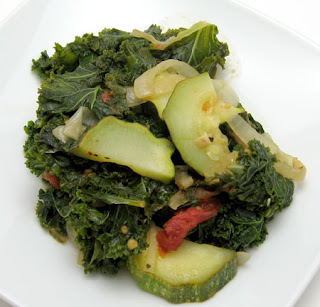 Somehow cooking kale with other veggies makes it less obvious that you're eating it for the umpteenth time this year. Mom said, "It was a really good blend of flavors. What's the word? Well-blended." Profound, Mom, profound. But I'm very glad that she liked my concoction! I enjoyed this so much that I'm submitting it to Weekend Herb Blogging, which is organized by Haalo from Cook (almost) Anything At Least Once, and is hosted by Prof. Kitty from The Cabinet of Prof. Kitty this week. In an attempt to avoid going crazy from consuming greens at every meal, I made a list of every recipe in my cookbooks that calls for some type of greens. It didn't take long for me to turn to the list and figure out what to do with my most recent bunch of Swiss chard. Heat oil in a medium saucepan over medium heat. Add onion and saute until tender and golden. Then stir in curry powder and cayenne and cook for another minute. Add stock and chard leaves and bring to a boil. Toss in the lentils and chickpeas, cover, reduce heat, and let simmer until the lentils are tender (about 10 min), stirring a couple of times. Serves 4. I made this on a whim, but ended up enjoying it far more than I ever thought I would. The flavors blended together nicely, and the curry and cayenne provided the perfect amount of spice. 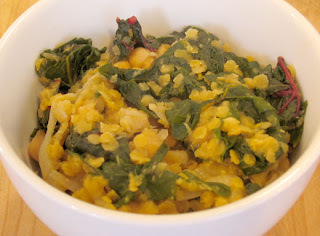 I liked the chickpeas in there - just when your mouth was getting used to the feel of lentils and chard, there was a new and surprising texture. I forgot how quickly red lentils cook, and I need to keep these around more often. This was definitely a winner! I'm submitting this to My Legume Love Affair, which is organized and hosted by Susan at The Well-Seasoned Cook. You may have noticed that I'm slightly obsessed with okra, and I love finding fellow okra lovers. Last week, Susan from Food Blogga posted a picture on Twitter of an okra dish that she had made, and it looked fabulous. I anxiously awaited the appearance of the recipe, and was overjoyed to find it a few days later. 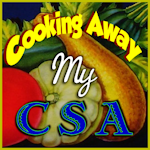 She also included a lot of great info about selecting, storing, and cooking okra, so go check out her post. As luck would have it, I found some lovely pods at the farmers' market this week. Every time I buy okra, I'm met with a look of confusion. Apparently I'm the only non-Indian shopper who buys the stuff here. Oh well, more for me! Heat oil over medium heat in a large skillet. Add onion and cook until tender (about 5 min). Then stir in the chicken and cook until browned (about 7 min). 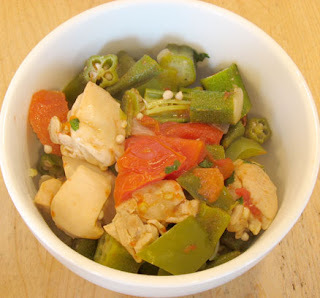 Add the bell pepper, okra, and jalapeno, and saute for a few minutes. Then dissolve the cornstarch in the stock, and add this and the tomatoes, cumin, and salt and pepper to the skillet. Bring to a boil, reduce heat, and let simmer until the veggies are completely tender (about 12 min). Stir in the cilantro and serve over your favorite grain (I used millet). Serves 4. This was just as good as I imagined, and I'm so glad that I tried it out! I really hope that I can continue to find okra for a while because there are many more recipes I want to try. The pods are already becoming somewhat large, and bigger is definitely not better in okra's case. I'll keep my fingers crossed! While flipping through this month's cookbook of the month, one recipe made the "must make" list: classic shrimp and tomatoes baked with feta. There's something about perfectly-cooked shrimp that makes me excessively happy. For years, anytime I stepped foot in a seafood restaurant, there was a 99.9% chance that I would order something with shrimp. My selections vary a bit more nowadays, but sometimes I regret not sticking with my favorite ocean critter. I've been cooking more shrimp lately, ever since I discovered the Shrimp Farm Market, a shrimp farm just down the road from me. It's even easier for me to buy it now that they have a stand at my favorite farmers' market on Saturdays. With shrimp on hand and some leftover feta that needed to be used, this recipe became a reality. Heat oil over medium heat in a large skillet. Add onion and garlic, and cook for a minute. Stir in tomatoes and continue to cook until they are tender (about 5 min). Add wine, brandy, tomato paste, dill, and pepper, and let cook until tomatoes are completely falling apart (about 10 min). Add the shrimp and stir just until they start to turn pink. Then top the shrimp and tomatoes with feta and keep over heat until feta begins to melt. Serve over rice. Serves 3. This dish made my night. It definitely caused me to have flashbacks to the time I spent in Greece, even though I don't think that I had seafood while I was there (what was I thinking?). The tomatoes soaked up all of the beautiful flavors of the wine, dill, and garlic, and were the perfect compliment to the shrimp and feta. I was worried that the shrimp would become overcooked while the feta was melting, but they weren't chewy at all. I also love that it took almost no time to make. It was the star of a perfect summer meal! After taking a little bit of a break from kale, I'm ready to take it on again. This recipe I noticed at Cinnamon & Spice is a little bit different from my usual kale saute with crushed red pepper, so I thought I would give it a shot. Heat oil over medium heat in a large skillet, and saute garlic for a minute or so. Add kale, coat in oil, cover, and let cook until wilted (a few minutes). Stir in the cranberries and honey, and season with salt and pepper. Let cook another minute or so, and then top with parmesan. Serves 3. This was just as good as it sounded. I love the combination of greens and dried fruit, and this was no exception. The cranberries and honey gave it just enough sweetness to provide a good contrast with the slightly bitter kale. This was a good way to ease back into the greens because it was so different and delicious. 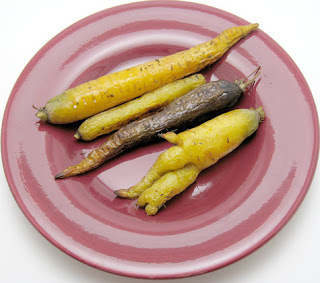 I doubt that I'll get tired of them this time now that there are so many different vegetables in season. But if I do, I will likely make this again to keep things interesting. I distinctly remember the first time I saw the movie Fried Green Tomatoes. I took a trip with my aunt and uncle to their lake house, and my aunt, always making sure that there was something to entertain me, brought a ton of movies. My aunt and uncle went to a neighbor's party one night, so I stayed at the house by myself and had a movie marathon. I don't know if I was old enough to really understand the movie, but I loved it, and still do. With that being said, the last time I remember tasting a fried green tomato was over 15 years ago at Cafe Tu Tu Tango in Atlanta. It's just not something I think about very often. 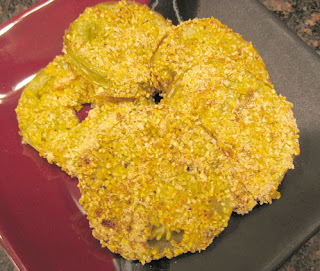 But the other day my friend Sam asked me about green tomatoes and then the idea was planted in my head. As luck would have it, there were green tomatoes when I arrived to pick up my friend's CSA share last week. Rather than frying them, I attempted a baked version. I learned one important lesson: whatever you do, remember to oil your baking sheet. Combine cornmeal, cumin, pepper, and salt on a small plate. Dip each slice of tomato into the eggs and coat well in the cornmeal mixture. Place on a well oiled baking sheet and bake at 400 for 20 min. Flip the tomatoes over and bake for an additional 10-20 min, until the tomatoes are tender and the outside is brown and crispy. Serves 3. Of course I forgot to oil the baking sheet, and they stuck like crazy, but they were still tasty. When I bit into one, I had a flashback to the last time I ate them. To me, there's nothing like a ripe red tomato that's fresh out of the garden, but the green ones have an interesting flavor that is all together different. They're not that great raw, but they develop a great flavor when cooked, even though they lack the sweetness of ripe tomatoes. Obviously they're great fried, but I enjoyed these baked ones. I wish I had a finer grind cornmeal on hand, but it worked out ok anyway. The contrast of the crispy coating and the mushy tomato is fabulous! Just make sure that you don't loose half of the coating on the pan. I spent a good part of Friday and Saturday at the Great Lakes Folk Festival, which is quite possibly my favorite event all summer. It always reminds me how much I love folk music, and the wide variety of international groups are phenomenal. This year, my favorites were the French-Acadian band from Prince Edward Island, the contemporary and traditional Irish group, and a crazy Cajun band. After many frustrations in the lab, this was the only thing that could make me feel better. At each of East Lansing's numerous summer festivals, international food reigns king. Unfortunately there are few quality international restaurants in the area, so many of the stands are not affiliated with local restaurants. One of the exceptions is Altu's, a local Ethiopian restaurant with fabulous food. I love seeing the Altu's stand at each festival because I had my first Ethiopian experience there, and was introduced to injera, a traditional flatbread made with teff flour. Of course this new grain intrigued me when I heard about it, so I decided to keep an eye out for teff grains. There's a spot on the shelf for teff at the local natural foods store, but it was never in stock. I finally came across some a few weeks ago, and was excited to try it out. Other than using teff flour for injera and gluten-free breads, I have only seen recipes for teff porridge and teff polenta. I went for the porridge. Combine teff and water in a medium saucepan. Bring to a boil, reduce heat, cover, and let simmer until the water is absorbed (about 20 min), stirring occasionally. Stir in butter and cinnamon and top with berries. To reheat, add a splash of water and stir well, breaking up clumps, before microwaving. Serves 4. This was fabulous! I highly recommend adding the cinnamon - it took it from good to great. I've heard people say that teff tastes like chocolate, and I can see how someone could come to that conclusion, but I'm not sure that I would have thought of it on my own. It's extremely filling because it's very high in protein and fiber. 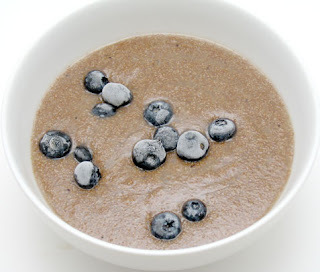 I think that this will become a regular in my porridge rotation, and I can't wait to try teff in other ways. Does anybody have any suggestions?? Whoops! 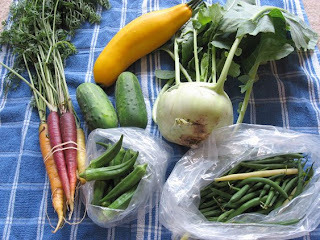 I forgot that I needed to do a round-up for my last CSA share until I picked up a new batch of veggies this week. I'm really excited that the variety is increasing with each week, and I can hopefully avoid having kale grow out of my hair follicles. On this particular week, I was about to go bonkers with all of the greens, so I rebelled and avoided the greens like the plague as I was choosing my items. Yes, that's my form of rebellion... obviously I was never a problem child. 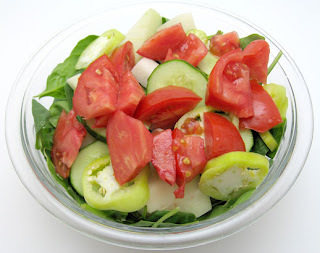 The kohlrabi and some of the pickled cucumbers made frequent appearances in salads. I LOVE salads filled with summer veggies. I am so excited to see more variety, and can't wait to see what the next few months bring. Today I confirmed that there will be more okra (it's in the greenhouse, so it will survive for quite a while!). I have to control myself when I go to the farmers' market because there are so many amazing fruits and veggies and I want to buy all of them. It's a good thing that I've been eating everything in sight lately! I've been eating cucumbers on salads since they arrived in my CSA box, but I wanted to try something different with them. During the summer, my grandmother keeps a container of cucumber slices in vinegar in the refrigerator. She puts them on the table at each meal, and then adds more cucumbers from the garden when the stock is running low. I love this method - the cukes retain their crispness and fresh taste, but they also have the acidity that I love about pickles. I've often done this myself (and learned the hard way that she must dilute the vinegar), but wanted to do something a little bit closer to a traditional pickle. I can't stop eating these to the point that I'm afraid that the acid is going to tear a whole in my stomach. They're great on salads or by themselves. 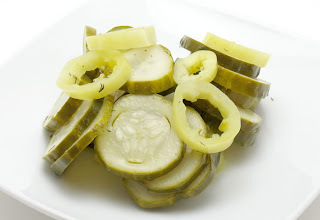 They definitely taste closer to a dill pickle than the ones stored only in vinegar, and it's worth the extra effort. I'm really glad that I threw the banana pepper in there - it's much better than the heavily pickled store-bought ones! After depleting some of the original stock, I tried adding more cucumber slices to the bowl as my grandmother usually does. They're good, but didn't absorb nearly as much of the vinegar flavor as the original ones and maintain more cucumber taste. If you're after a strong pickle flavor, make a new batch each time. But make sure to make a lot because they'll go faster than you could ever imagine. I'm submitting this to Weekend Herb Blogging, which is organized by Haalo from Cook (almost) Anything At Least Once, and is hosted by Dhanggit from Dhanggit's Kitchen this week. As you may have noticed, I love making bread. After I discovered that I may have a gluten sensitivity, I lived without bread for over a month because I didn't want to invest in the crew of gluten-free flours and baking aids until I knew that gluten was indeed my problem. Well, there were a couple of weeks when I had to cram it down my throat in order to have an accurate test for celiac disease, but I definitely didn't enjoy it when I knew that it was the thing making me miserable. I finally dug into my savings last week and acquired all of the necessary supplies for gluten-free bread. But where to start?? The first place I turned was Karina's Kitchen. Karina has a beautiful blog that I've been reading for an extremely long time (far before I ever suspected that I may have a problem with gluten). She has a number of dietary restrictions (gluten, soy, dairy, almond, eggs) yet still manages to create fabulous recipes. Karina came through for me with this amazing bread recipe. Combine flours, starch, gum, and salt in a small bowl and set aside. Add water, oil, honey, vinegar, and eggs to a 1 1/2 lb bread machine. Pour the flour mixture on top, and add the yeast to the top of the flour. Cook on the quick cycle (or gluten-free cycle if your machine has one). Check the dough on the last kneading cycle, and push down any flour on the sides of the pan with a plastic or wooden spatula if necessary. Also, the dough should be like muffin dough (not in a ball like wheat bread dough), so add more flour or water if it is wetter or drier than this. Remove from the machine after it's done baking - don't let it go through the cooling cycle or it will get soggy. Let cool and slice. I store my bread in the freezer (in a ziploc freezer bag) and toast it when I want a piece. It keeps extremely well this way. If you would rather make this bread by hand, Karina has great instructions. I may try this next time just for fun. I have to admit that I was nervous all day. I've heard so many horror stories about gluten-free bread. Many people say that it's never as good as wheat bread, but you learn to get used to it because that's your only option. Well, Karina broke these "rules" because this is fabulous! 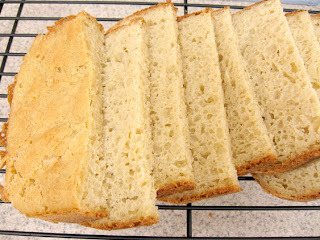 It's not like your typical wheat bread, but it has a great flavor that reminds me of a mix of cornbread and biscuits. It didn't rise as much as it could have, but got about as high as my 100% whole wheat breads once did. It has a great texture, with an almost buttery feel in my mouth. Basically I loved everything about this bread. I'm extremely happy about how this turned out. I knew Karina would lead me in the right direction, but I had no idea that she could work miracles! I'll probably play around with this recipe and try others just for kicks, but it's great to know that I have a solid bread recipe that works wonderfully. Right now I'm not missing gluten at all!! I don't cook fish very often, even though I really enjoy it when I do. Perhaps it's because I feel odd eating fish in the middle of Michigan, after spending the first 17 years of my life within 60 miles of the ocean. More recently, I've neglected fish because it's hard to find sustainable options in the Lansing area (unless you're willing to shell out the big bucks). But as I was walking through Whole Foods in Ann Arbor last week trying to find the remaining gluten-free flours that do not exist in the Lansing area, I noticed that they had snapper on sale, and it looked amazing. I brought some home, not quite sure what it would become. I had already decided to make this month's cookbook of the month "The Olive and the Caper" by Susanna Hoffman. As you might guess from the title, this book is filled with Greek recipes, as well as stories and histories of Greece and Greek food. My dad found this book for me for my birthday last year, and it's been sitting on my shelf ever since. I just didn't feel right making Greek food in the winter, although this might be because I've only been to Greece in June, and remember sweating quite profusely. It was originally going to be the cookbook of the month for July, but given that I was just figuring out how to do the whole gluten-free thing, I thought I should wait a little while to start experimenting with a new cuisine. Plus, I really wanted to make phyllo dough from the book's recipe, and that was obviously out (and after some reading, it looks like it's virtually impossible to reconstruct with gluten-free flours). But now I've stocked up my pantry, feel more comfortable making gluten-free substitutions, and am ready to try some of the non-phyllo recipes in this book. 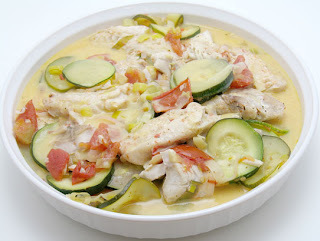 I was delighted to find a recipe that combined the snapper with zucchini and tomatoes that I had from the market. Season fish on both sides with juice of 1/2 lemon and salt, and let it sit while you prepare the other ingredients. Heat the oil in a large skillet over medium heat. Add the leek and cook for 2 min. Then stir in zucchini, tomatoes, sage, and wine. Saute until the zucchini is tender (6-8 min). Then put the fish into the skillet, covering it with some of the veggies. Cover the skillet and cook until the fish gets flaky (mine took 10 min, but it will depend on the type and thickness of fish). Remove the fish and veggies from the pan, leaving the sauce behind, and set aside. Mix the egg yolks and lemon together, and then whisk this into the sauce in the skillet. Let cook over low heat until sauce is thickened (about 5 min). Pour the sauce over the fish and veggies. Serves 4. This was a really good way to cook fish - it came out perfectly flaky, but still very moist. The veggies were also very good, and the tomatoes melted into the sauce nicely. The only change that I would make next time is to slightly reduce the amount of lemon added to the pan sauce. I know it's supposed to be lemony (it is Greek, after all), but it slightly overpowered the other flavors. Overall, though, I really enjoyed it. The other nice thing is that this seems to reheat fabulously, unlike many fish recipes. This is one of the simplest veggie sides that I've made in a long time, but I loved the colors. That's one of my favorite changes to the farmers' market in the last few weeks. For so long it was tables and tables filled with all kinds of green things (various kinds of greens, lettuce, herbs, potted plants, peas, etc.). But that's all changing now with the arrival of tomatoes, squash, various kinds of potatoes, onions, berries, and peaches (just to name a few!). 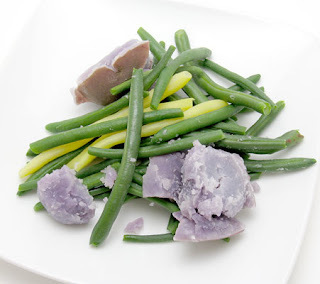 When I stopped by the Cinzori Farms stand for some potatoes, I knew I wanted the purple ones. The woman manning the stand that day said that she had purple-skinned ones, as well as ones that also have purple flesh. Did she even have to ask? These went perfectly with green and yellow beans (these are from my CSA share, and they only had a few yellow beans ready). Bring a medium pot of salted water to a boil. Add potatoes, cover pot, and let boil until they begin to get tender, but aren't cooked through (10-15 min, depending on the size of your potatoes). Add beans and continue to cook until beans and potatoes are tender (another 5-10 min). Drain and season with butter, salt, and pepper (or your favorite seasonings). Serves 3. Simple and delicious. This is summer at its finest. My first memorable hominy experience occurred a few years ago when some friends from New Mexico made a large pot of pozole. I loved it, but apparently this didn't spur thoughts of making pozole myself or using hominy in other dishes. Several months ago, I was flipping through Lorna Sass's "Whole Grains Every Day, Every Way" and noticed the section on hominy. I ended up making her hominy with shredded chicken and peppers, and absolutely adored it. A few days after complaining about only having access to canned hominy, I came across the dried kind in Whole Foods while in Ann Arbor. It's been sitting in my kitchen since March calling my name. I finally answered. Combine first 9 ingredients (through stock) in medium crock pot (I used a 3 1/2 quart - don't use anything bigger unless you plan to double the recipe). Lay chicken on top of this mixture, and top with hominy and salsa. Cover and cook on low for 6-7 hours. Use two forks to pull apart the chicken, and remove bones if you used bone-in meat. Serves 3. Soak 12 oz dried hominy in cold water overnight. Drain hominy and place in a medium crock pot (I used a 3 1/2 quart; reduce hominy quantity if you use a smaller one). Fill crock 3/4 of the way with water (don't go to the very top). Cook on high for an hour, and then low for 9-12 hours, until hominy is tender. Keep an eye on it in the last few hours of cooking, and add more water if necessary. When hominy is done, drain and let cool. Keeps refrigerated for a few days, or frozen for months (I froze it in 1 1/2 cup portions). Makes about 8 cups. This was amazing! The flavors turned out perfectly, and I'm very glad that I used the tomatillo salsa instead of tomatoes. The chicken was so tender that most of it had fallen apart on its own. It's extremely spicy because my chili powder and salsa are on the hot side, so cut back on these or use mild ones if you're not a fan of heat. Or if you really want to make fire shoot out of your ears, add a chopped jalapeno to the veggie mixture... but don't say I didn't warn you. I loved the hominy in this, and I'm glad I have a freezer full of cooked hominy now (anybody have a favorite recipe???). This concludes our July cookbook of the month adventure. "Not Your Mother's Slow Cooker Cookbook" is a very solid cookbook with recipes that adapt a ton of types of foods for the crock pot. 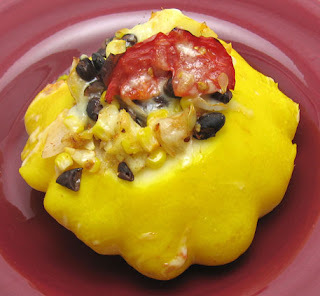 By far, my favorite recipes were this one and the squash enchilada casserole. Perhaps that proves the point that mexican flavors are very well suited to slow cooking. I also really enjoyed the mixed grain porridge, and made another version (with only mixed rice and oats) last week. That will definitely become a staple breakfast item because it's ready right when I wake up, and extremely delicious. The two veggie dishes that I made (roasted summer vegetables and napa cabbage with apples) were also very good, but the results weren't changed dramatically by being cooked in the crock pot. It's a nice method if you want to prepare things in advance and occupy yourself with something else while they're cooking, though. And finally, the chili with venison sausage was a solid recipe, and I can see myself tweaking it in the future. There are many more recipes in this book - lots more soups, chilis, beans, grains, breakfasts, meats, and even desserts - and it's a great starting point for beginning to use your crock pot. When I showed up to pick up my CSA share this week, a grin instantly appeared on my face. There were a few small boxes of okra sitting there calling my name. Although Rebecca from Titus Farms sends out an email each week to let us know the likely options for that week, she leaves the iffy things off the list. I didn't even know that they were growing okra, so it was an extremely unexpected surprise. This is the prettiest okra I've seen since I moved to Michigan - small, perfect pods. I didn't have very much, and I wanted to savor it over a couple of meals. Hopefully they'll have more in the future because I've been fervently collecting okra recipes since I made this. Heat olive oil in a small saucepan over medium heat. Add onion and saute until tender. Stir in crushed red pepper and okra, and let cook for 3 minutes. Stir in tomato, bring to a simmer, and reduce heat to medium low. Let this cook until the tomato juices thicken (about 10 min). Whisk together eggs, milk, turmeric, and salt and pepper. 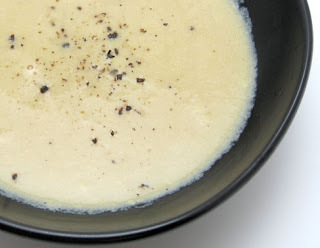 Heat butter over medium-low heat in a medium-sized nonstick skillet. When butter melts, add egg mixture and let cook until the edges are cooked. Then flip omelet with a spatula and let cook an additional minute on the other side. 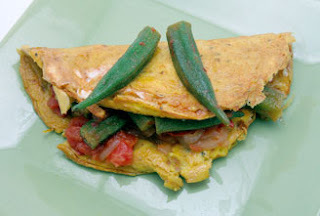 Add half of the okra and tomato mixture to the middle of the omelet. Spicy, delicious, and comforting. 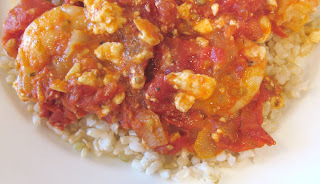 I love stewed okra and tomatoes, and the flavors meshed nicely with the eggs. 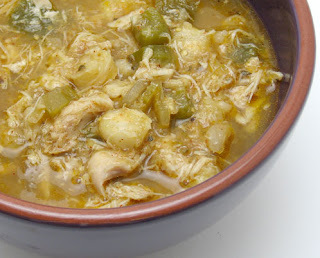 It worked well as a dinner and breakfast, and was extremely quick to make (especially if you make the okra and tomato mixture ahead of time). I'm submitting this to Weekend Herb Blogging, which is organized by Haalo from Cook (almost) Anything At Least Once, and is hosted by Anna from Anna's Cool Finds this week.